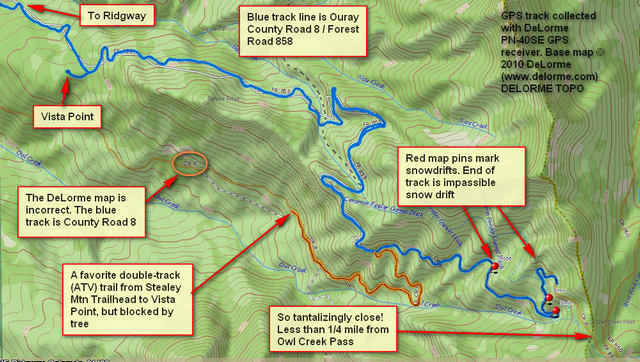 I went exploring this evening to see how far up Ouray County Road 8 (also Forest Service Road 858). 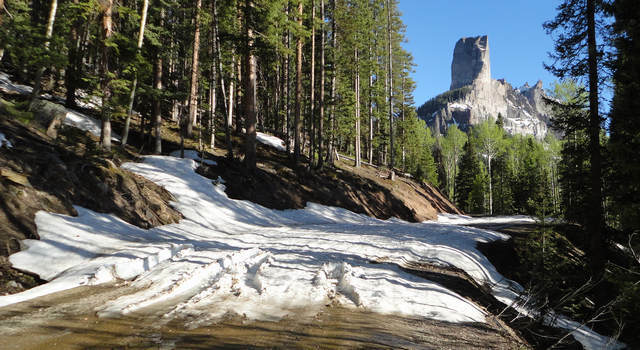 The answer is that I got tantalizingly close to Owl Creek Pass (see GPS track), but there are still snowdrifts across the road. The picture below shows where I stopped—and apparently everyone else did too, given there are no tracks all the way across. Owl Creek Pass Road snowdrift blocks road. That's Chimney Rock in the background. The GPS map below shows how far I got—within a quarter mile of the pass itself! GPS of Ouray CR 8 and FR 858. The blue line is the road. The red map pins mark snowdrifts as of today. The orange line is an ATV trail (doubletrack) that's blocked by a tree. I also checked out one of my favorite doubletrack trails (ATV and motorcycle, no Jeeps) that starts at Stealey Mountain Trailhead and ends at Vista Point. Alas, within site of Vista Point, this tree blocked the trail. That trunk is about a foot in diameter, too big for me to comfortably push the motorcycle over. 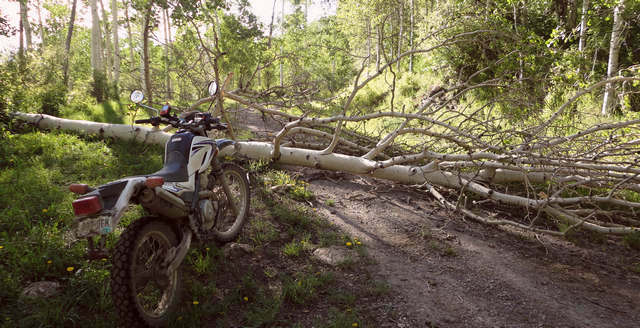 It looks as though the trail has been cleared of trees, but this one fell after that. The doubletrack from Stealey Mtn Trailhead to Vista Point is blocked by this tree, about a foot in diameter. Here it is June 15th, and still the pass isn’t open. It makes me think that the real high-country roads, such as Engineer Pass, can’t possibly be open yet. Hopefully they will be by July 4th! This entry was posted in GPS Tracks, Motorcycling, Ouray County and tagged owl creek pass, stealey mtn trailhead, vista point. Bookmark the permalink.